Studying the skies to any great effect is usually done from huge observatories with enormous telescopes hidden inside. They cost millions and are often built in the middle of nowhere. That way it’s easier to get a better fix on what’s up there in the heavens by avoiding light pollution as much as possible. But, the downside is that they’re static and being stuck in one place offers less scope for astronomers. Now, though, there are moves afoot to let astronomers get their stargazing done using a mobile laboratory and it’s all based around a tough, go-anywhere off-roader. 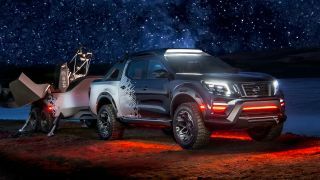 The Nissan Navara Dark Sky Concept is an idea that has been developed in the UK, in collaboration with the European Space Agency (ESA), and the eye-catching outcome is a pickup/trailer combination like no other. Nissan’s Navara is already a firm favourite with pickup fans. The likes of builders and farmers in particular enjoy its high-rise, rugged characteristics. Increasingly though the likeable four-wheeler is being bought and driven by people who want a higher sitting position and off-road capabilities but a driving experience that’s not too far removed from a run-of-the mill saloon. That makes it the perfect platform for a mobile observatory. A crucial ingredient for the ESA project is the way this truck has been built to go just about anywhere. To get away from that all-pervasive light pollution and head right into the darkness you need a bit of kit to get you there without destroying the brittle lenses found in fragile telescopes. The Navara has big wheels and tyres, plus plenty of ground clearance, so ESA astronomers can now get their telescope wherever they want it without damage. Alongside being a practical solution to the problem the Dark Sky Concept Navara looks pretty cool too. While it might be designed to get a job done, the UK development team have had some fun along the way, adding tasty cosmetic touches including a funky exterior finish and lots of space-inspired bits and bobs on the inside. It looks like no other pickup on the road, and is far removed from your typical builder’s workhorse. Outside, the design has a clever continuity line that runs from the pickup itself through to the trailer, which has been carefully modelled to emulate the smooth-but-angular lines of the Navara. There are flushed in wraparound tail lights, plus twin axles that feature cool six-spoke alloy wheels fitted with chunky go-anywhere rubber. The pickup also comes decked out with ESA logos, which also turns it into a neat mobile hoarding for the agency. Having a bespoke trailer with off-road capabilities will be a real boon to ESA, as it can be towed anywhere the pickup can go. The trailer is fitted with an observatory-class PlaneWave telescope, which is perfect for capturing high quality views of the stars. With the top down and the telescope moved into position, it offers an enviable new angle to see what’s going on in space. The Navara's cavernous interior provides plenty of people-carrying capacity, and from the look of these images, it appears to be a pretty good place to escape to when the great outdoors becomes less welcoming and the opportunity of a hot drink and a few hours’ kip makes more sense. The Navara features a beefed up edition of Nissan’s ProPILOT driver assistance, which means that it’s more than capable of traversing the most unwelcoming countryside thanks to its steering assist technologies. On the highway, the advanced cruise control system will get the ESA folks back to base smoothly and safely. It’s not autonomous, but instead offers lots of help while you’re at the wheel via a front-mounted radar sensor and a front-facing camera. The pickup and trailer combination was revealed at the Hannover motor show. "The tough pickup trucks on display are the perfect embodiment of Nissan’s dedication to excellence in conversions," said Ashwani Gupta, senior vice president of the Nissan Light Commercial Vehicle (LCV) business unit, at the unveiling.